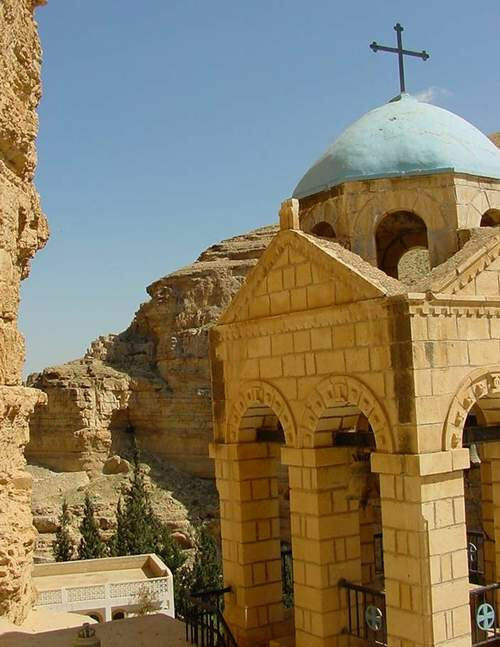 The spectacle of the Monastery of St George — a cliff-hanging complex carved into a sheer rock wall in the Judaean Desert, overlooking an unexpectedly lush garden with olive and cypress trees — is one of the most striking sights of the Holy Land. 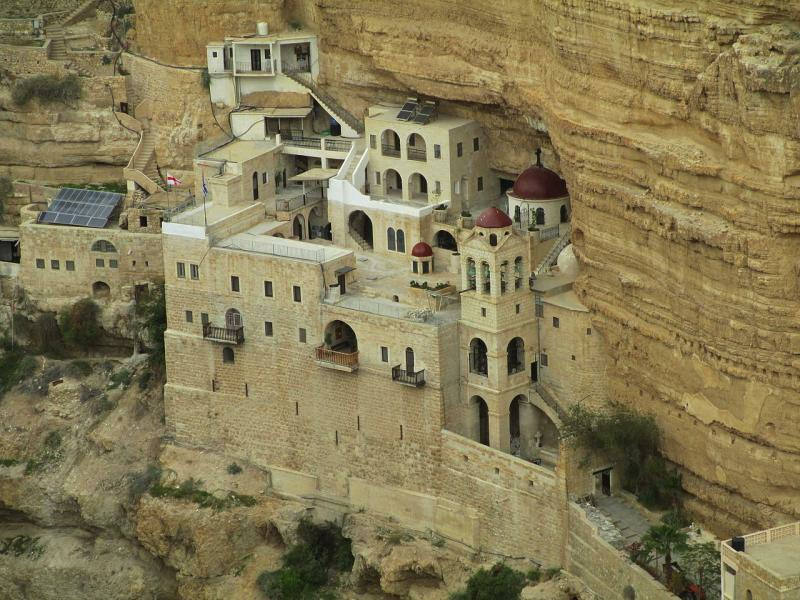 The monastery’s picturesque setting is in a deep and narrow gorge called Wadi Qelt, in a cliff face pocked with caves and recesses that have offered habitation to monks and hermits for many centuries. 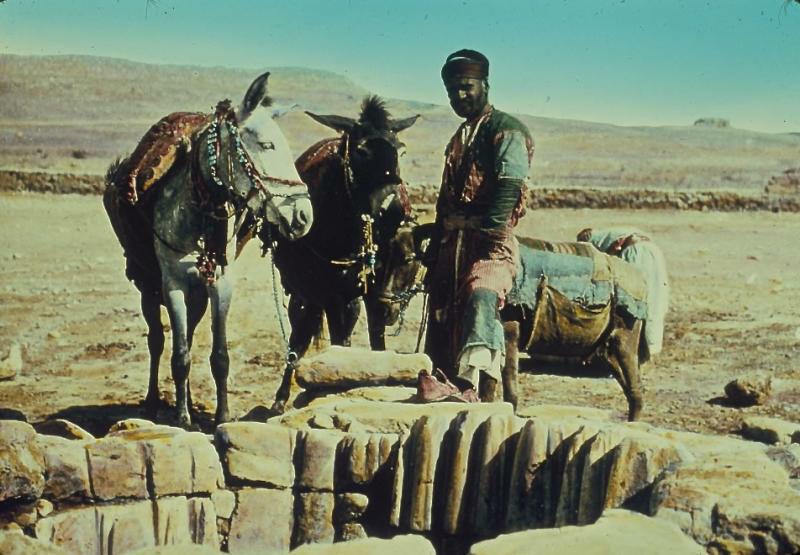 The wadi winds its deep and tortuous course for 35 kilometres between Jerusalem and Jericho — for most of the way providing a route for the Roman road on which Jesus set the parable of the Good Samaritan (Luke 10:25-37). Some also envisage it as the “valley of the shadow of death” in Psalm 23. 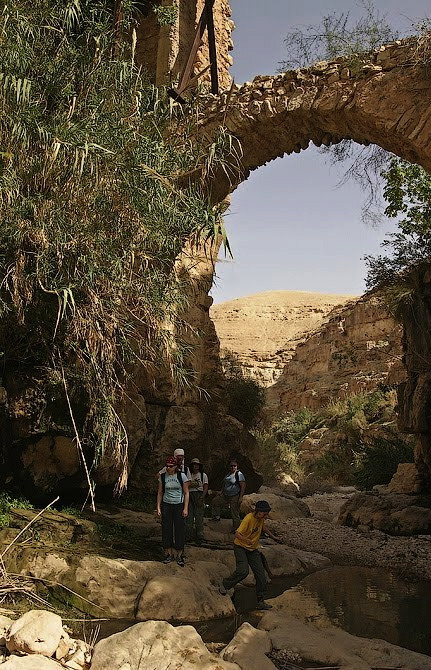 The monastery, founded in the 5th century, is about 9 kilometres from Jericho and about 20 kilometres from Jerusalem, and on a favourite trail for hikers. It is well known for its hospitality and, unlike most Greek Orthodox monasteries, welcomes female pilgrims and visitors — following a precedent set when a Byzantine noblewoman claimed the Virgin Mary had directed her there for healing from an incurable illness. 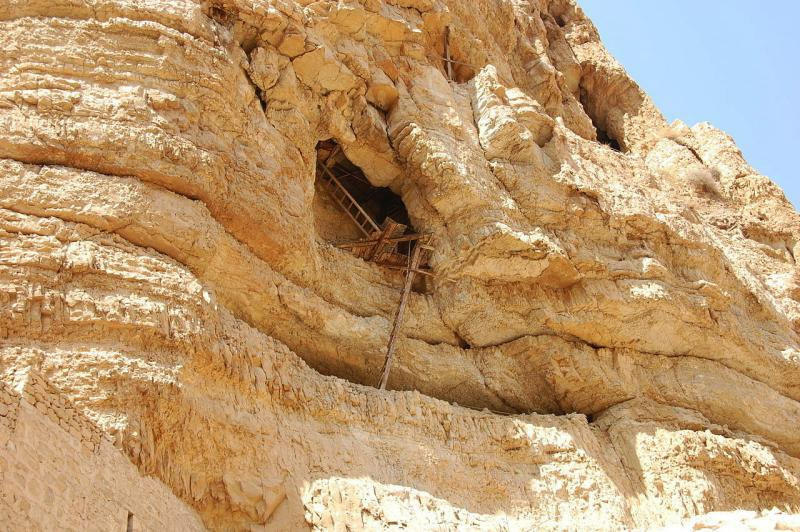 The monastery was founded in the 5th century when John of Thebes, an Egyptian, drew together a cluster of five Syrian hermits who had settled around a cave where they believed the prophet Elijah was fed by ravens (1 Kings 17:5-6). But it is named after its most famous monk, St George of Koziba, who came as a teenager from Cyprus to follow the ascetic life in the Holy Land in the 6th century, after both his parents died. Another tradition links a large cave above the monastery with St Joachim, father of the Virgin Mary. He is said to have stopped to lament the barrenness of his wife, St Anne — until an angel arrived to tell him she would conceive. 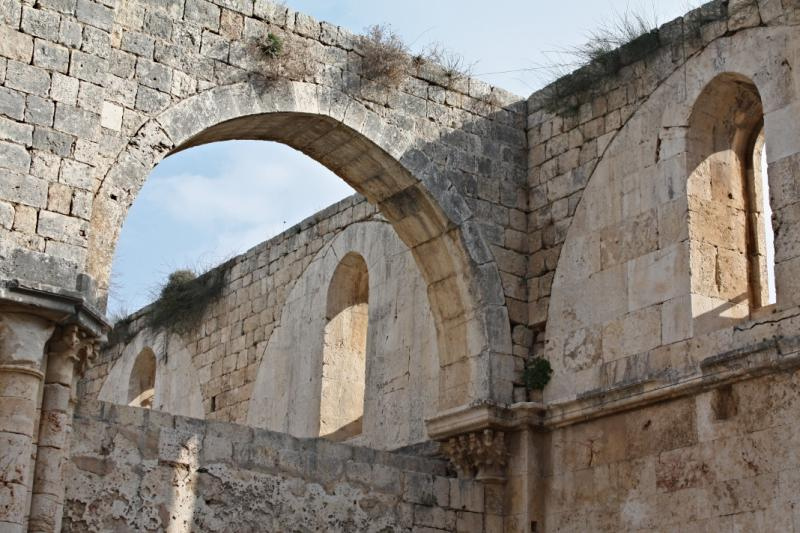 The monastery went through the phases of destruction in the 7th century by the Persians (who martyred all 14 resident monks), rebuilding in the 12th century by the Crusaders, then disuse after the Crusaders were expelled from the Holy Land. Complete restoration was undertaken by a Greek monk, Callinicos, between 1878 and 1901. The bell tower was added in 1952. In 2010 a new road improved access, but visitors must walk down a steep and winding path for about 15 minutes (or hire a donkey from local Bedouin) to reach the monastery. 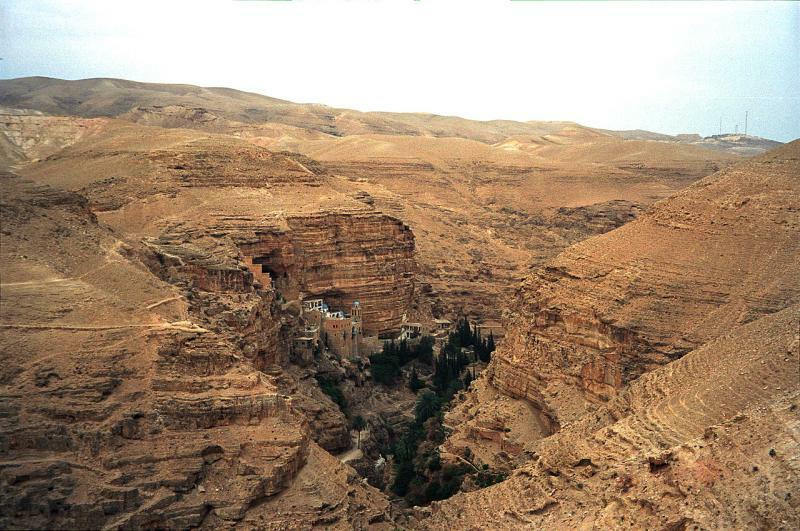 Just a handful of monks remain at St George’s, one of only five monasteries still functioning in the Judaean Desert. The three-level monastery complex encompasses two churches, the Church of the Holy Virgin and the Church of St George and St John. They contain a rich array of icons, paintings and mosaics. In the ornate Church of the Holy Virgin, the principal place of worship, a mosaic pavement depicts the Byzantine double-headed eagle in black, white and red. The royal doors in the centre of the relatively modern iconostasis date from the 12th century. The Church of St John and St George has a 6th-century mosaic floor. A reliquary contains the skulls of the 14 monks martyred by the Persians, and a glass casket encloses the incorrupt remains of a Romanian monk who died in 1960. A niche contains the tomb of St George. 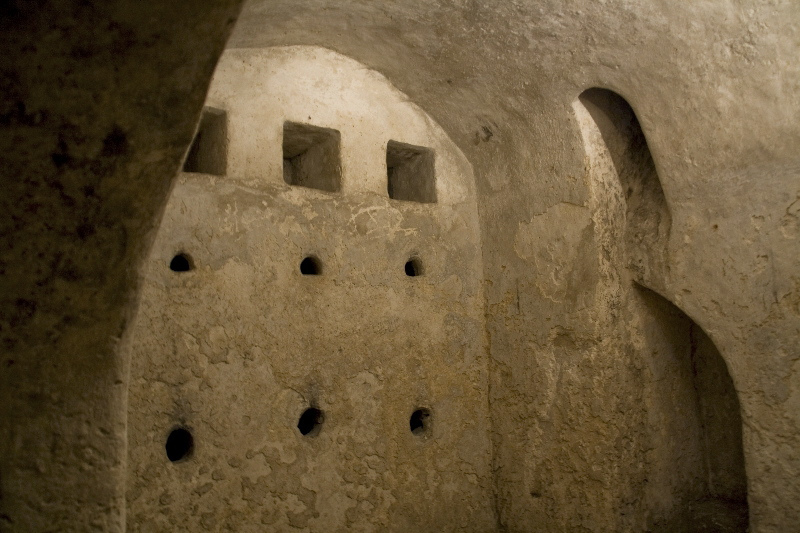 The monastery also holds the tombs of the five hermits who began the monastery. Stairs from the inner court of the monastery lead to the cave-church of St Elijah. From this cave, a narrow tunnel provides an escape route to the top of the mountain. The view from the balcony of the inner court includes Roman aqueducts supported by massive walls on the other side of the wadi. 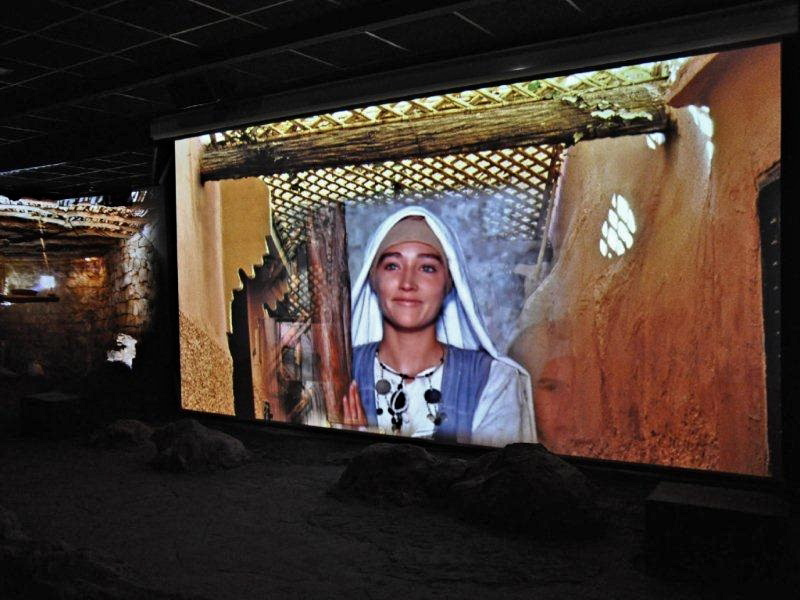 Modern multimedia technology portrays the Virgin Mary’s role in salvation history at the Mary of Nazareth International Center, just across the street from the towering basilica that commemorates her agreement to become the mother of the Son of God. A 55-minute, wide-screen presentation, offered in 10 languages, gives visitors a sweeping perspective of Mary’s place in Scripture. The content is divided into four parts, each viewed in a separate room: from Creation to Mary’s childhood; from the Annunciation to Jesus’ birth; the 30 years in Nazareth and Jesus’ public life; and from Good Friday to Easter Sunday. The presentation, using still and movie photography, is firmly grounded in Scripture, with no fewer than 224 biblical passages quoted. Other exhibits focus on Mary as a Jewish woman, Mary in the Qur’an (which has more references to her than in the Bible), Mary as a source of Christian unity, and Mary in the tradition of the Eastern Christian churches. 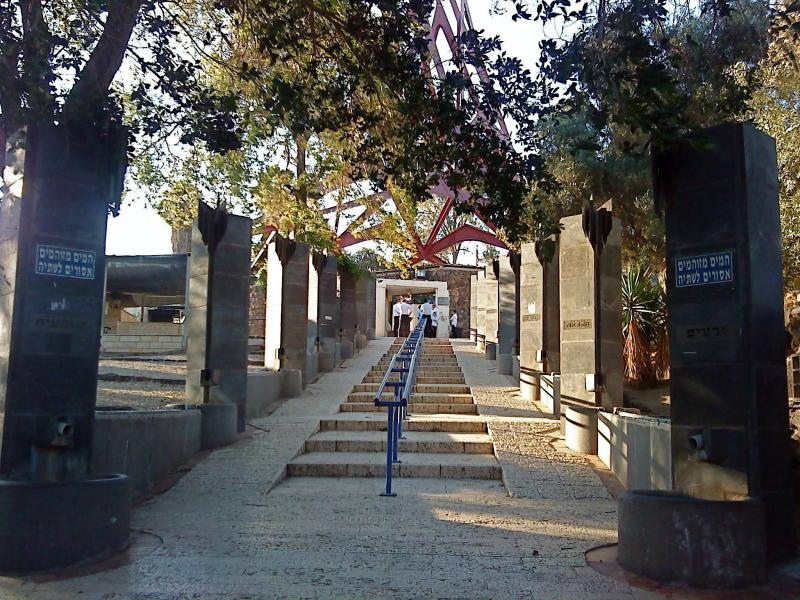 There is also a world map of Marian shrines, and a terraced garden with plants that are mentioned in the Bible. 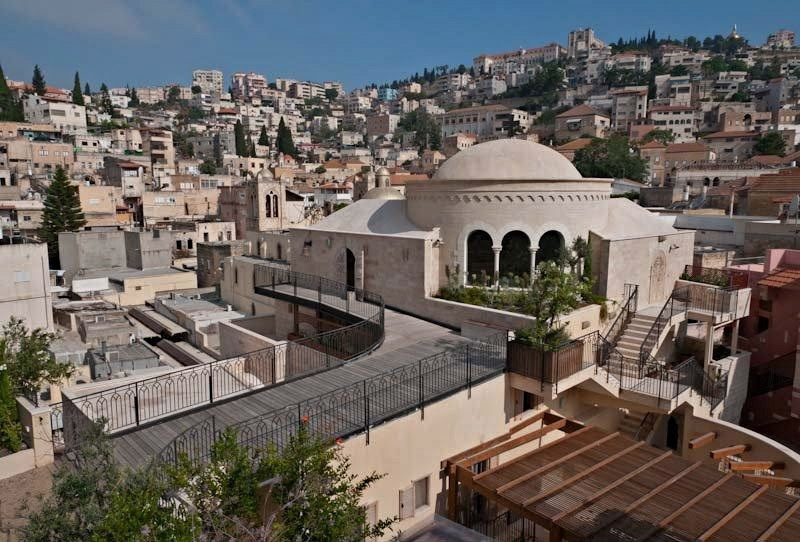 The centre, opened in 2011 in a renovated building from the Ottoman era, also contains a significant archaeological discovery — the remains of an ancient house that archaeologists believe is from the Jewish village of Nazareth at the time of Jesus and Mary. The impetus for a Nazareth venue celebrating Mary’s role in salvation history — God’s actions through human history to fulfill his purpose of saving mankind — came from the Association Marie de Nazareth, a Catholic group based in France, which also raised the funding. The association promotes Christian belief through modern audio-visual techniques such as podcasts, websites, television documentaries and media centres. The Mary of Nazareth centre is run by the Chemin Neuf (“New Way”) Community, another French Catholic group, which has an ecumenical ministry in which Christians from different denominations take part. 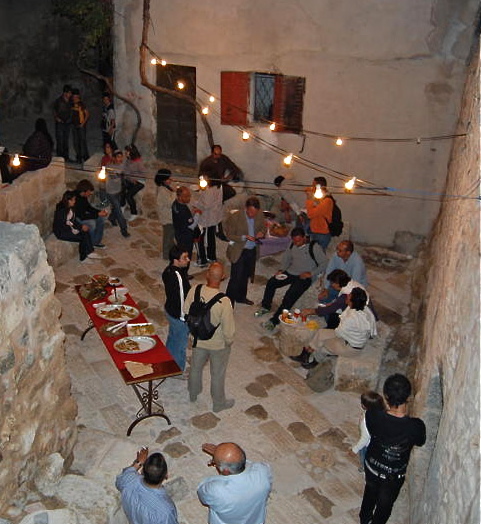 Though relations between Christian churches in the Holy Land are not always harmonious — scuffles with broomsticks are not unknown at sacred sites — the centre has received the support of the 12 major Christian churches of the Holy Land, including Latin and Eastern Catholics, Eastern and Oriental Orthodox, Anglicans and Lutherans. 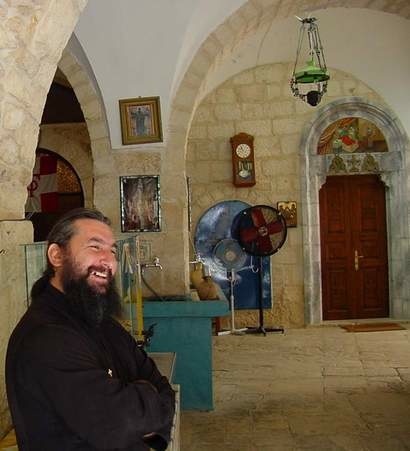 “Never in history have all the Christian churches of the Holy Land — Catholic, Orthodox and Protestant — united in such a way to support the same project,” said Bishop Giacinto-Boulos Marcuzzo, the Latin (Catholic) patriarchal vicar in Nazareth. Workers preparing the centre were digging up an old courtyard when they uncovered the walls of an ancient house. Archaeologists then found two rooms, a courtyard with a rock-hewn cistern in which rainwater was collected from the roof, and fragments of clay and chalk vessels. They also found a pit whose entrance was apparently camouflaged, presumably used by Jews to hide from Roman soldiers during the First Jewish-Roman War in AD 67. 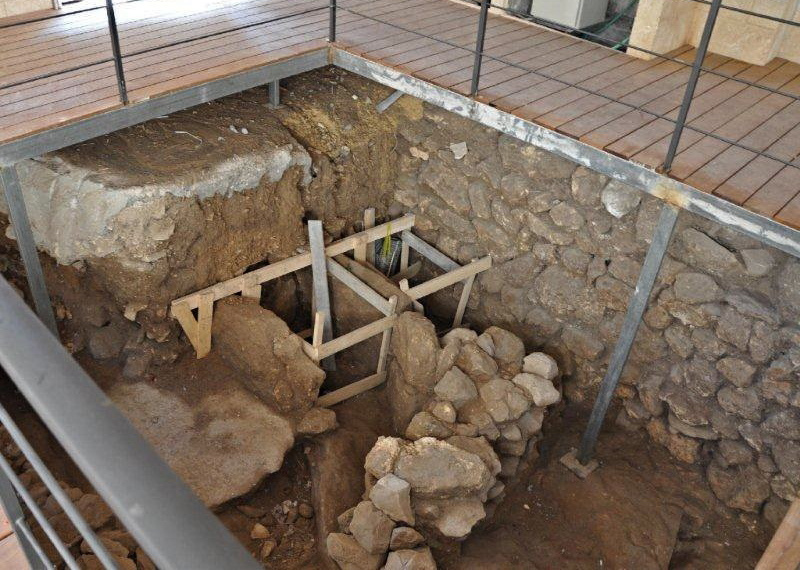 The Israel Antiquities Authority declared the remains were of the first residential building dating to the time of Jesus ever discovered in Nazareth. 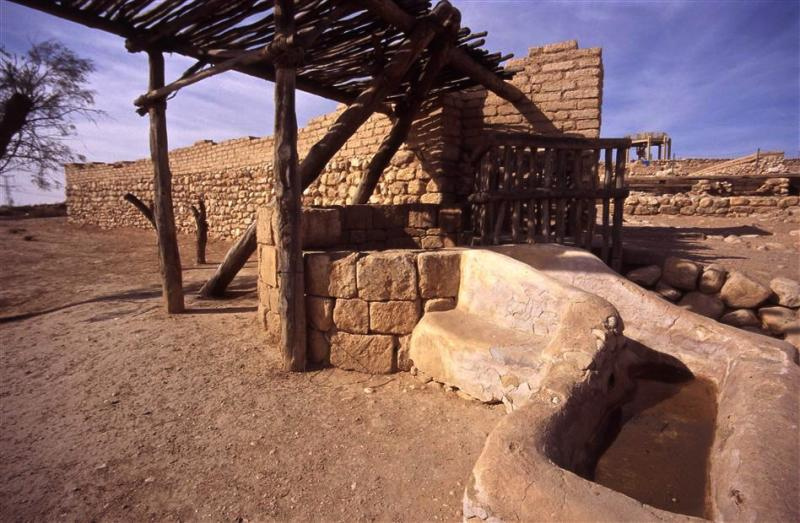 Nazareth at the time probably had a population of between 400 and 1200, so it might have had as few as 100 houses. The remains discovered were only 50 metres from the Church of the Annunciation, where tradition places the home of Joseph, Mary and Jesus, so it is almost certain that Jesus knew the house and might even have visited it. The remains of the house have been conserved within the Mary of Nazareth centre. Open: Mon-Sat 9.30-12am, 2.30-5pm; closed Sunday (private bookings available at any time). 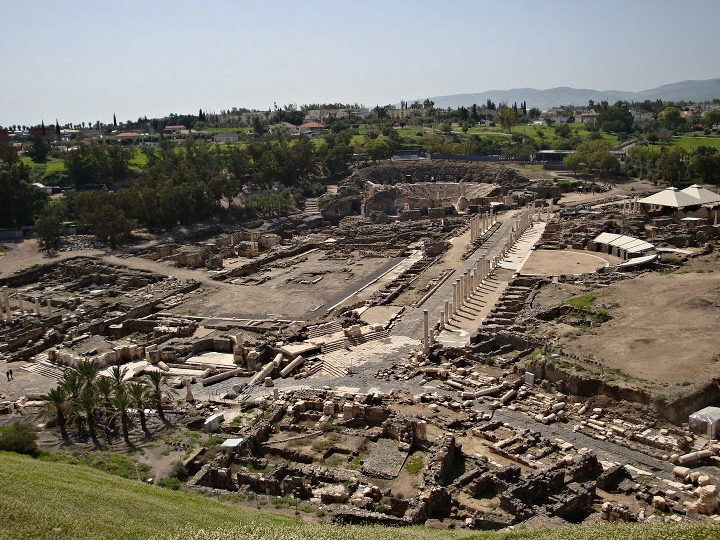 Beit She’an offers the most extensive archaeological site in Israel, with some of the best-preserved ruins in the Middle East, but its memory will forever be linked to one of the most ghoulish events in the Bible. 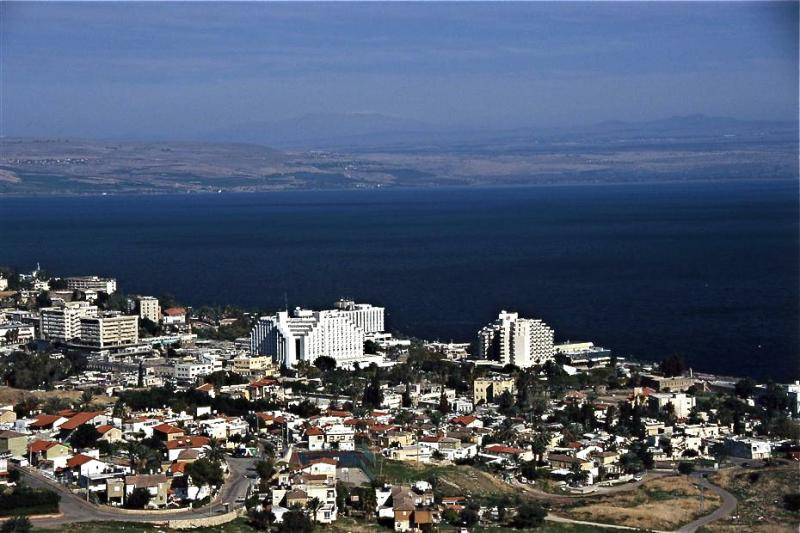 On nearby Mount Gilboa in 1004 BC, the army of King Saul, Israel’s first king, was defeated by the Philistines and Saul’s three sons were killed. To avoid capture, the wounded Saul fell on his sword. 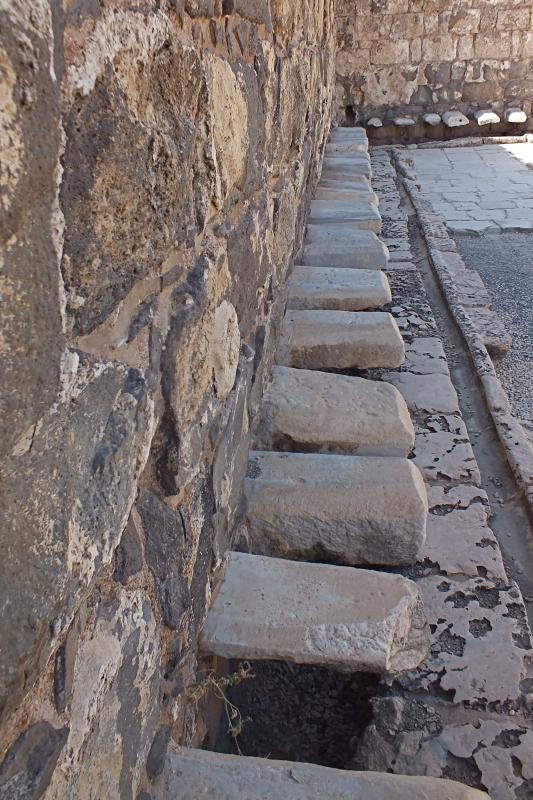 The triumphant Philistines took the bodies of Saul and his sons and fastened them to the wall of Beit She’an. They put Saul’s armour in their temple. David, who was to succeed Saul as king, composed a memorable lament over the tragedy, with the recurring line “How the mighty have fallen . 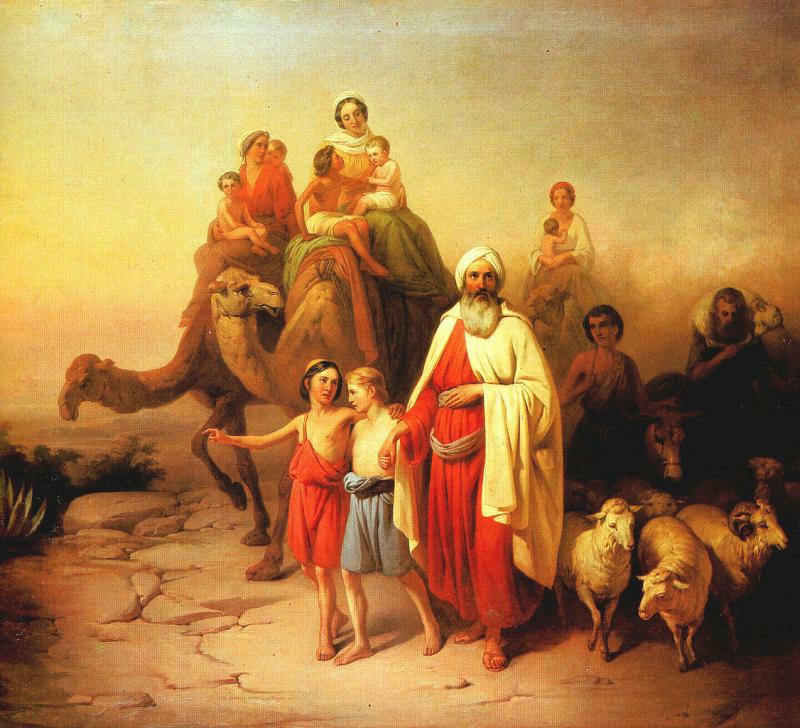 . . ” (2 Samuel 1:17 – 27). 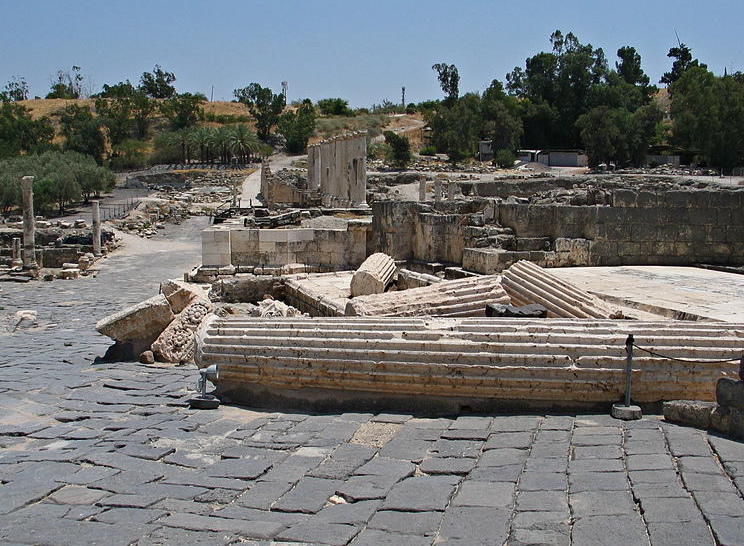 Beit She’an is about 13 kilometres south of the Sea of Galilee. 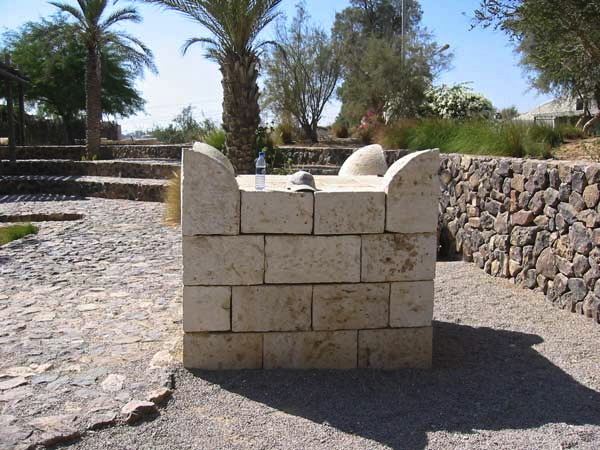 Its location at the strategic junction of the Jezreel and Jordan valleys made it a coveted prize for conquerors. Apart from the Philistines, its rulers included Egyptians, Israelites (though the Canaanite inhabitants initially rebuffed them), Greeks and Romans. 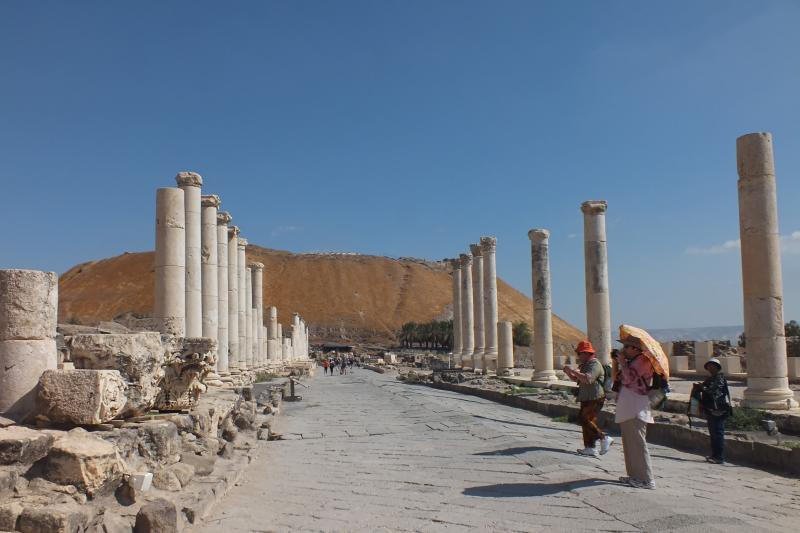 In the Roman period — under the name of Scythopolis — it was the leading city of the Decapolis and the only one of these 10 semi-autonomous cities west of the Jordan River. 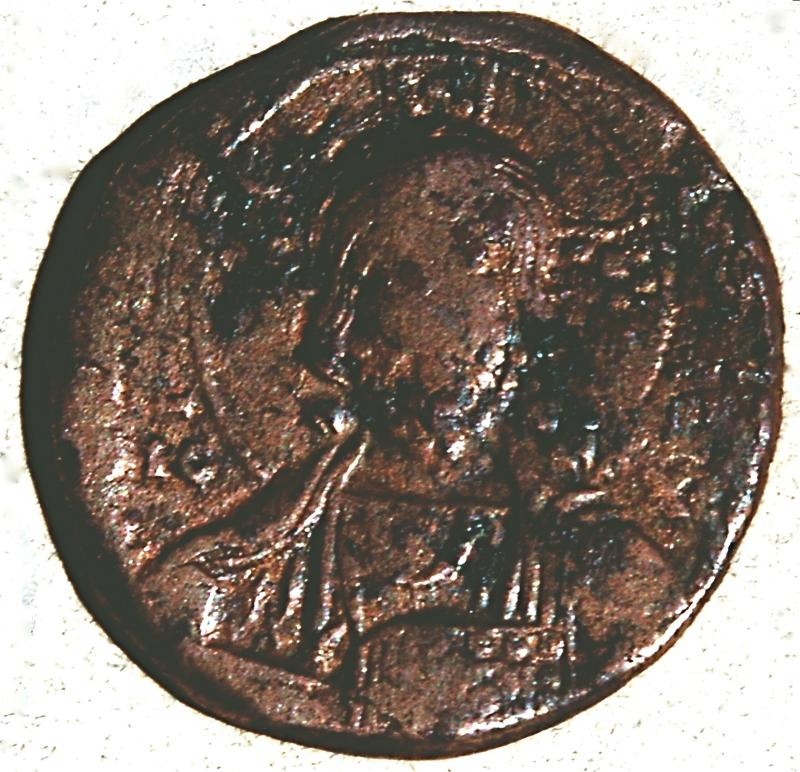 From the 4th century until it was destroyed by an earthquake in 749, the formerly pagan city was a flourishing Christian centre, with a bishop and several churches. 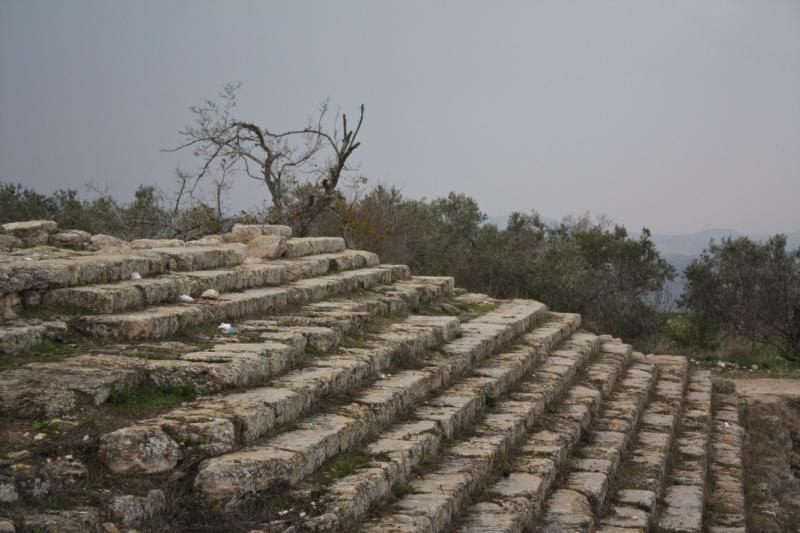 Beit She’an began on the flat-topped hill that stands behind the ruins of the Roman-Byzantine city. This ancient tell, 80 metres high, contains 18 levels of occupation down to the first settlers around 4000 BC. In Roman times the inhabitants moved to the flat area at the foot of the hill. Here the city expanded to around 150 hectares in area, with wide colonnaded streets leading to elegant shops with marble facades and mosaic floors. 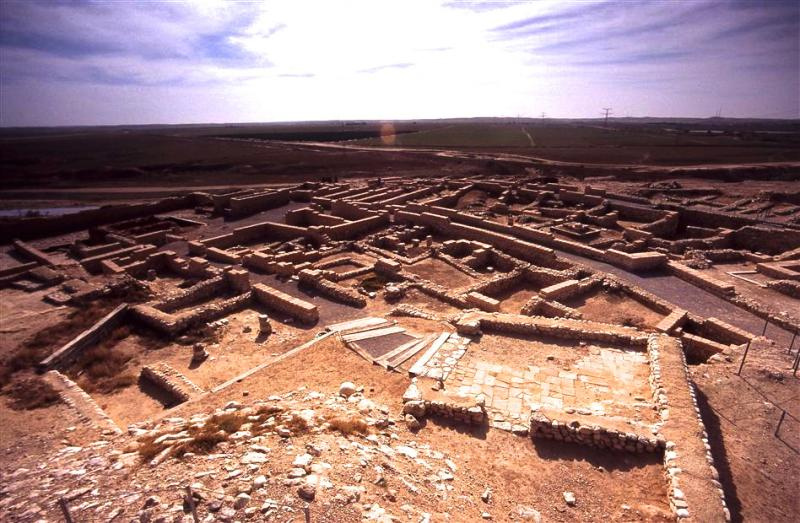 The population of Scythopolis grew to 40,000 and the linen it produced made it one of the leading textile centres of the Roman empire. Centuries later it became a centre for processing cane sugar. • A three-tiered theatre for dramatic performances, seating 7000 people. 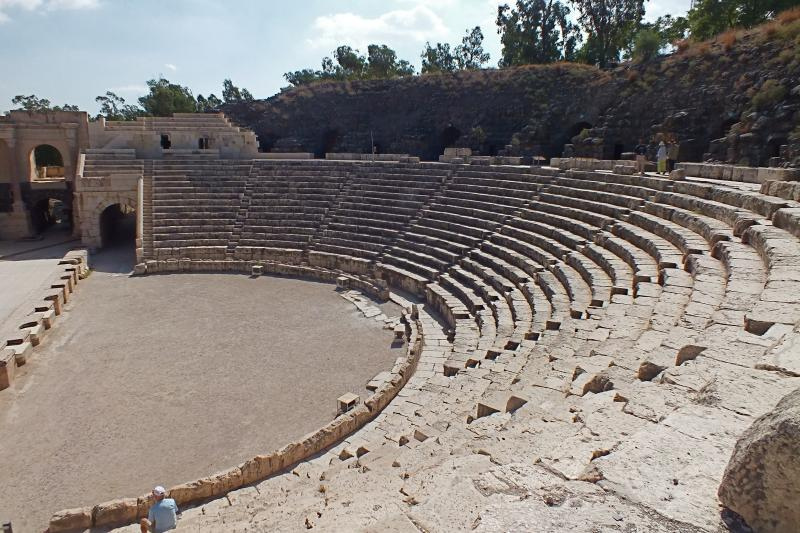 • An amphitheatre holding 6000, where gladiatorial contests entertained soldiers of the Sixth Legion which was based here. 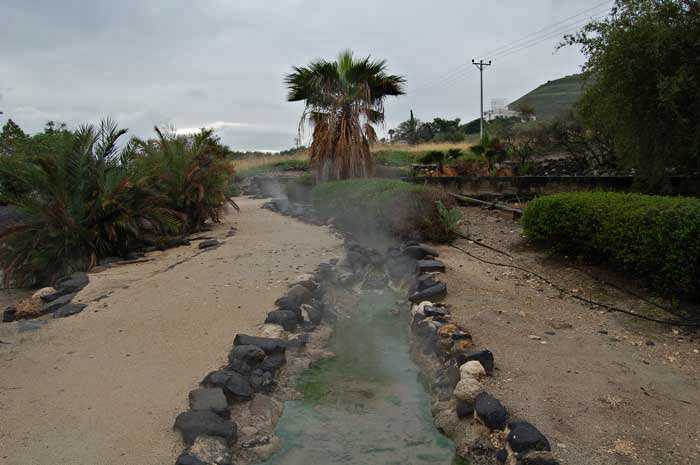 • A huge bath and gym complex with swimming pools and halls heated by hot air from furnaces. Its public toilets had channels underneath with running water. • A Roman basilica that served as a courthouse and administrative centre. • A nymphaeum, an elaborate monumental building with a decorative fountain. • A mosaic of Tyche, the Roman goddess of good fortune, wearing the walled city of Scythopolis as a crown and holding the horn of plenty in her hand. 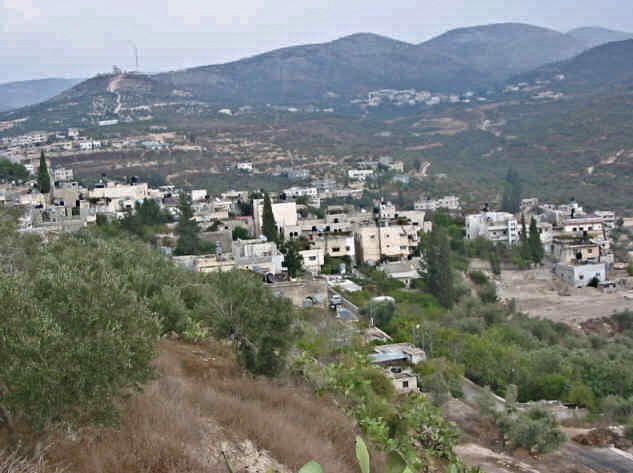 On the summit of the tell, a steep climb obtains a sweeping panorama of the ruins below, the Jordan and Harod valleys and Mount Gilboa. 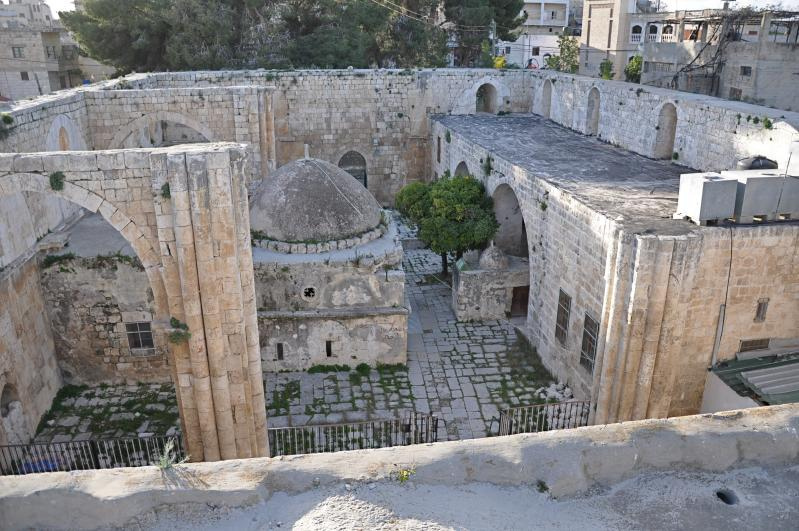 Here a great circular church, with a cloister around an open court, replaced the earlier Canaanite and Philistine temples during the Byzantine era. Among the other churches in the lower city, one was dedicated to Procopius, a local martyr. 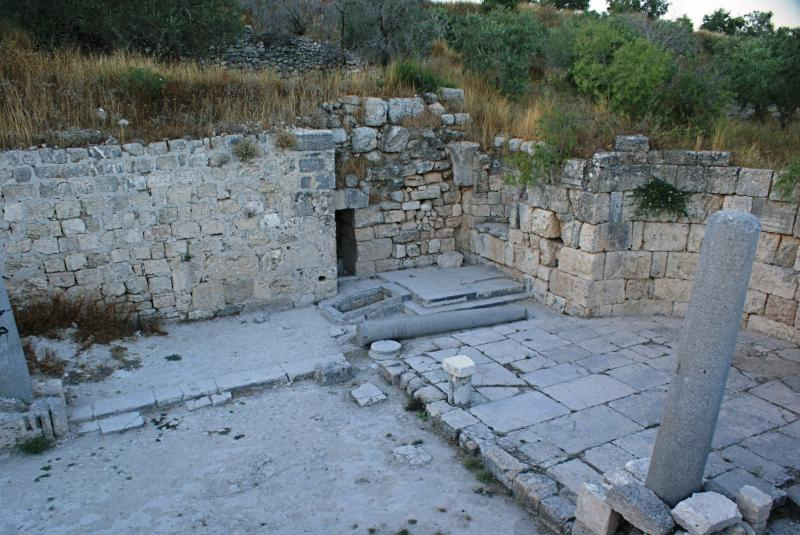 Its location is unknown, but remains of other church buildings have been found and a striking red cross can be seen on the plaster wall of a niche in a bathhouse, probably used as a baptistry. The modern town of Beit She’an has encroached on some of the ancient ruins. One of these is the Monastery of the Lady Mary, founded in 567 and named after a donor, perhaps the wife of a Byzantine official. 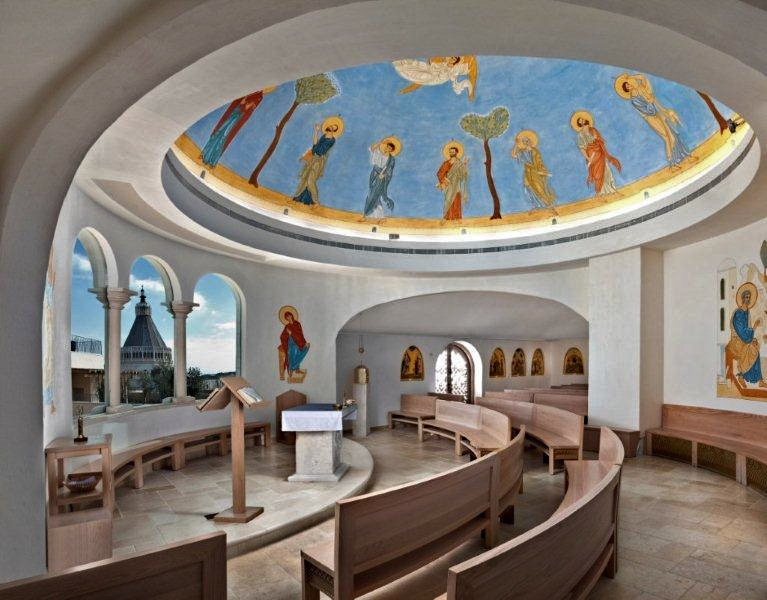 This complex — not usually open to the public — contains a series of rooms with beautiful mosaic floors. The mosaic in the central hall of the chapel depicts animals such as lions, camels, boars and ostriches around a zodiac illustrating the months of the year. 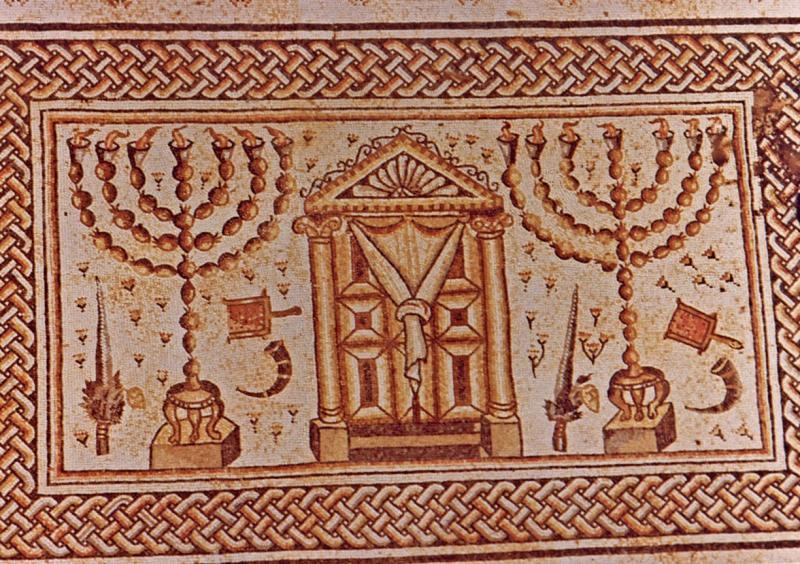 Interestingly, the remains of Jewish and Samaritan synagogues have been found along with churches from the time when Scythopolis was a Christian city. And after a Muslim army conquered the city in 634 and renamed the city Baysan, Christians and Muslims lived together until the disastrous earthquake of 749. Open: Apr-Sept 8am-5pm (except Friday 8am-4pm); Oct-Mar 8am-4pm (except Saturday 8am-5pm). Last entry to site one hour before closing time.